June 14, 2016 June 7, 2016 by Beau H.
If you’ve been keeping up with the #OOTD series here on The Style Guide, you’ll notice we’ve covered a heck of a lot of ground. But with warm weather heating up, we haven’t quite covered how to wear a short-sleeve shirt for summer. Now if you scroll ahead, you might notice this look is a bit layered up for summer. But if it goes get too hot, the jacket can always be ditched. Back to the matter at hand. A crisp short-sleeve shirt — not one that calls to mind Dwight Schrute, mind you — can be styled exactly like you might style a polo or a classic blue Oxford. So you’ll need to look for one that’s cut slim and modern, in a summer-appropriate color and/or pattern (this Bonobos Riviera Oxford is an ideal example of what we’re looking for). And given hot summer temps for most of us, short sleeves are going to be a nice substitute for, well, longer sleeves. A slim short-sleeve shirt can even be called into action under a blazer — it’s a secret warm-weather style move designed to keep you cool. But the below look aims for versatile style that looks a bit rugged, a bit polished and a whole lot of good. If you’re down with that, read on. For tips on how to style short-sleeve shirts for summer, hit me up on Instagram in the meantime. Pairing a surefire short-sleeve shirt with a mix of style essentials. The Shirt: JACHS NY Cream and Blue Horizontal Striped Short-sleeve Shirt, $89: JACHS NY produces style staples that are at once a bit prep-inspired and continental in nature, and this shirt is a fine example. It’s the perfect length untucked, and would look great with denim or shorts in other ensembles. The Jacket: JackThreads Trucker Jacket in Seeded Natural, $79: Why, you might ask, does a denim jacket feature in this photo if it’s hot out? Well, it’s there to transition from day to night, and the excellent Natural color provides a great style swerve from a classic denim jacket. The Pants: Buck Mason Iron Chinos, $135: Just like the Buck Mason Sand Chinos featured on this site earlier this spring, these Iron Chinos feature a modern cut, nice color and made-in-America construction. The Loafers: Sebago Norwich Bison Penny Loafers, $165: These aren’t your average loafers, made with rich Horween Bison leather and designed to break in over time. Not quite too dressy, not quite too casual. The Belt: J. Crew Factory Double-Striped Webbing Belt, $14.50: Worried about pairing two sets of stripes together? The scale of the belt, plus the nice off-white color, helps the belt stand out from the shirt itself. The Socks: Mack Weldon No-show Socks, $16.50: For just over $16, you get not one, but two pairs of reliable, comfortable socks — crucial with loafers and rolled chinos. The Wallet: Issara Minimalist Wallet, $69: Nearly $70 certainly is a lot for a card case, but when it’s crafted from rich navy leather and fits in the front pocket of your chinos (or slim blue denim, or a tailored suit), it’s worth the price. 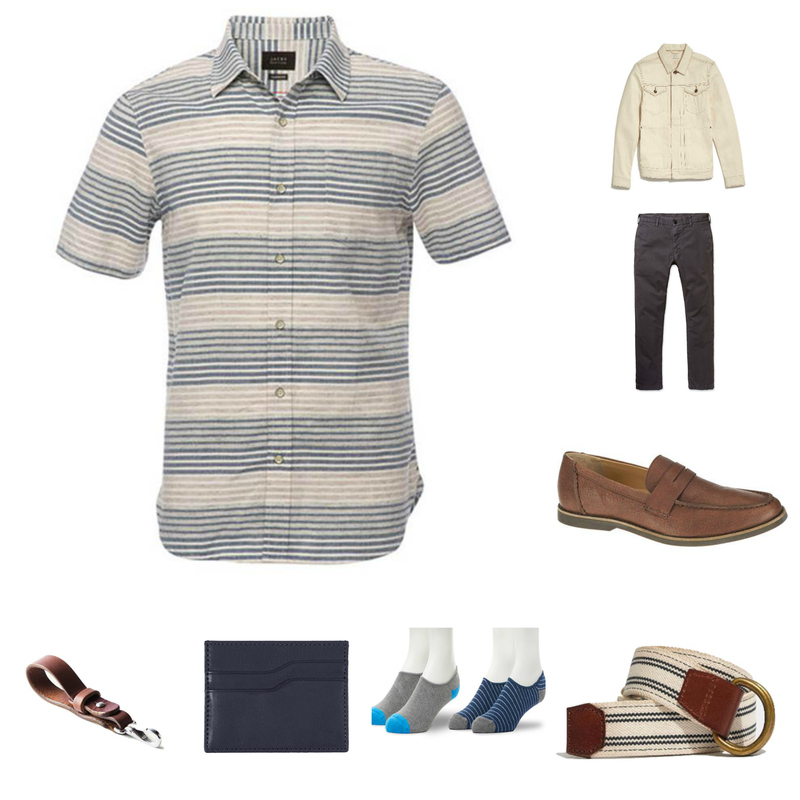 If you don’t yet have a short-sleeve shirt or two in your closet, it’s a wise bet to pick up one that goes with quite a few ensembles — the striped blue-and-cream number above works with dark denim, slim light wash jeans, tan chinos or a stylish pair of chino shorts, along with all kinds of summer footwear picks. When you add in the fact that it looks great over top a pair of four-season chinos and some rugged loafers, it’s certainly a winning style move. Crisp, minimal accessories like a handmade lanyard and a reliable wallet certainly work well in nearly every style situation, too. If you’re hestitant to try one out, think of it like a slim summer polo, or even a classic chambray shirt, and go from there. Give me a shout on Twitter with style questions — come one, come all! What’s your take on the above #OOTD? Would you change any pieces?